"I want our country to exploit all the natural resources we have. I want us to keep energy bills down and I want us to be part of that revolution, which can create thousands of jobs." With these words David Cameron, at Prime Minister's Questions on 1st July, could have been expressing his support for developing onshore wind and other renewable energy resources - but he wasn't. Instead he was responding to the question: "Given the Prime Minister’s commitment to localism, will he stand by and respect the decision made by Lancashire County Council this week to reject fracking, yes or no?". His answer started, "Those decisions must be made by local authorities in the proper way, under the planning regime we have. Personally, I hope that, over time, unconventional gas sites will go ahead, whether in Lancashire or elsewhere." The Prime Minister's personal support for fracking is no surprise. But his government's 'localism' when it comes to energy development appears to be fictional. This is shown not just in the heavy-handed approach to promoting fracking but in hostility to wind and often solar power. As Secretary of Stage for Communities and Local Government, Eric Pickles frequently intervened personally to block wind turbines being built, while his intervention to reject a solar farm was termed 'perverse' by the judge on appeal. Newly in power in a majority government, the Tories were quick to make a move on wind energy, cutting subsidies to prevent 250 planned wind farms, 2,500 turbines and 7.1GW of clean energy for this country. But that was not all. On 18th June Greg Clark, the new Secretary of Stage for Communities and Local Government, finally delivered for Tory backbenchers on the ominous pledge in his party's manifesto to "halt the spread of subsidised onshore wind farms", with a set of requirements to make building new wind turbines almost impossible. · following consultation, it can be demonstrated that the planning impacts identified by affected local communities have been fully addressed and therefore the proposal has their backing. [No other form of development requires full community support] In applying these new considerations, suitable areas for wind energy development will need to have been allocated clearly in a Local or Neighbourhood Plan. Maps showing the wind resource as favourable to wind turbines, or similar, will not be sufficient. Whether a proposal has the backing of the affected local community is a planning judgement for the local planning authority. Back to fracking: the planning guidance published in 2013 told local authorities there was "a pressing need" for exploratory drilling to see if economically viable full scale production was possible and that planners should give "great weight" to the benefits of extraction. The contrast was noted at the time with the wording for renewables guidance which stated, "all communities have a responsibility to help increase the use and supply of green energy, but this does not mean that the need for renewable energy automatically overrides environmental protections and the planning concerns of local communities". Despite government claims that fracking will create thousands of jobs and is essential for the economy (claims which hardly stand up to scrutiny, and are dwarfed by the potential of renewables and energy efficiency - see analysis for the North West and One Million Climate Jobs) the scale of local activism, from Lancashire to Balcombe is keeping frackers at bay so far. Campaigners wait to see what the government's next step will be. It has already, in the Infrastructure Act, removed the right of landowners to to be consulted on fracking if it is over 300m below their property. The DECC consultation on this proposal received some 40,000 responses, with over 99% objecting to the proposals to allow deep level fracking without landowner consent. What would true localism in energy development look like? In countries that have been the most successful in developing renewable energy, such as Germany and Denmark, this has been done by supporting small-scale community generation. 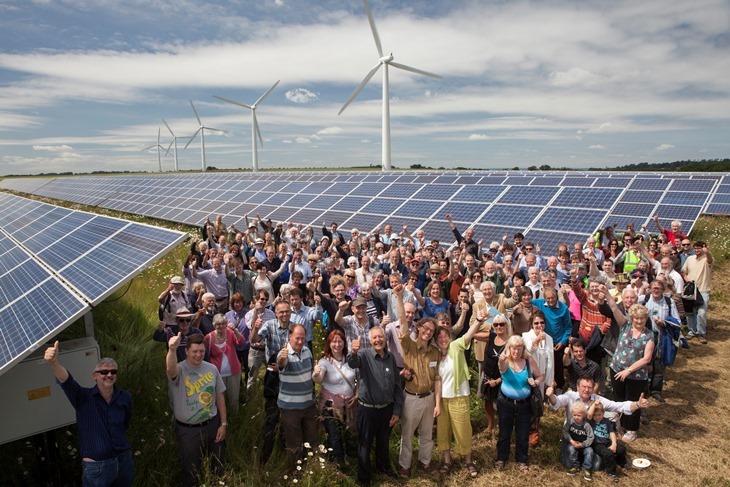 The community energy sector in the UK has faced many more obstacles, and as some are removed, others are added. but determinism and optimism has seen many successful projects flourish, with benefits going back to communities. Now the government seems determined not just to block commercial wind farms but to cut this burgeoning energy democracy off at its knees. It is true that wind farms face more local opposition here than in countries which have a more community-based approach to development. But wind power remains generally popular, far more so than fracking. Can new community wind farms, at least, be saved from the axe? Small renewables schemes are subsidised through Feed in Tariffs and a review of the levels at which these are set is coming up this summer. It is essential that these subsidies are retained for community wind energy. But we need to take the battle further. Can the energy and determination of anti-fracking campaigners be harnessed to the fight for real energy democracy - beyond the Big Six to local energy control? UPDATE: In his 'emergency budget, George Osborne has announced another shameless attack on renewables in the form of a £3.9 billion tax grab over six years.